The patella (knee cap) is a protective bone attached to the quadriceps muscles of the thigh by the quadriceps tendon. The patella attaches with the femur bone and forms the patellofemoral joint. The patella is protected by a ligament called the medial patellofemoral ligament (MPFL) which secures the kneecap and prevents it from gliding out of alignment. 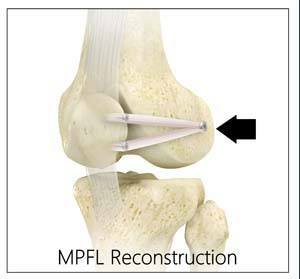 The MPFL may be torn as a result of a direct blow or trauma and twisting of the knee while changing direction. The torn MPF ligament may be removed and reconstructed using a grafting technique. Grafts are usually harvested from the hamstring tendons, located at the back of the knee and are fixed to the patella tendon using screws. The grafts are either taken from the same individual (autograft) or from a donor (allograft). This procedure may be performed minimally invasive using an arthroscope. After the surgery, your doctor will suggest you use crutches for a few weeks, prescribe medications to control pain and swelling, and recommend physical therapy which will help you to return to your sports activities at the earliest.